Cact. Hort. Dyck. (1844) ed. II. 214. Origin and Habitat: Tropical areas of southern Mexico (Guanajuato, Hidalgo, Jalisco, México, Michoacán, Morelos, Nayarit, Oaxaca, Puebla, Aguascalientes Querétaro and Sinoaloa), but now largely spreading around Mexico. It has also been naturalized in many regions, such as Australia and it is widely cultivated because of its flowers. Habitat and Ecology: The species grows in tropical deciduous dry forest. There are no known major threats to this species. 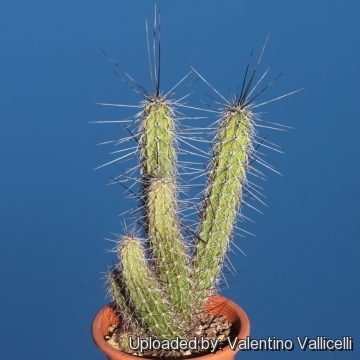 Description: Peniocereus serpentinus is a fast-growing slender, shrubby columnar cactus that grows often in groups, erect at first sometimes climbing then leaning and sprawling all over and best tied to something so it wont fall and grow decumbent. It would be good for hanging baskets. 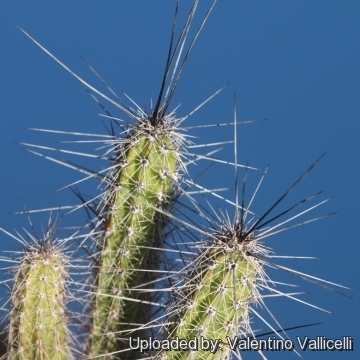 This species is in need of taxonomic review as in Mexico it is recognized as a separate genus Nyctocereus; there is genetic evidence for this. 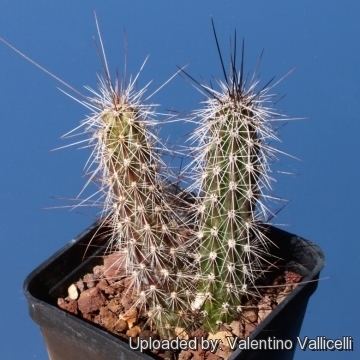 Spines: 9 to 14 needle-like spines, whitish to reddish when young, with darker tips, 10-30 mm long. Flowers: When old enough it bears large, nocturnal flowers, they are funnelform, white with pinkish outside segments, 15 to 20 cm long (15 cm in diameter), pericarpel and flowers with bristles. The flowers are very fragrant, like gardenias. 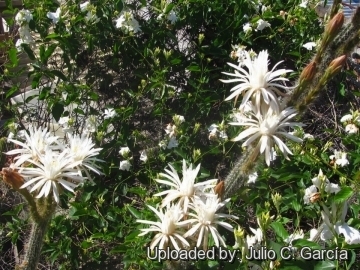 Peniocereus serpentinus (Lag. & Rodr.) N.P.Taylor: It is fast-growing slender, shrubby columnar cactus that grows often in groups, erect at first sometimes climbing then leaning and sprawling all over and best tied to something so it wont fall and grow decumbent. 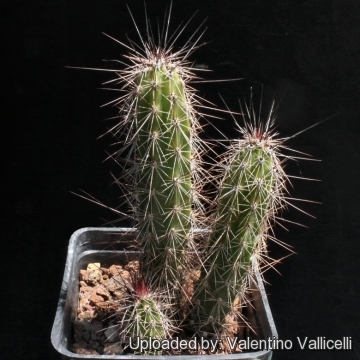 Peniocereus serpentinus f. cristata: The crested form stay smaller and forms pronounced sculpture effects. 8) Arreola, H., Bárcenas Luna, R., Cházaro, M., Guadalupe Martínez, J., Sánchez , E. & Terrazas, T. 2013. Peniocereus serpentinus. The IUCN Red List of Threatened Species. Version 2014.3. <www.iucnredlist.org>. Downloaded on 25 November 2014. 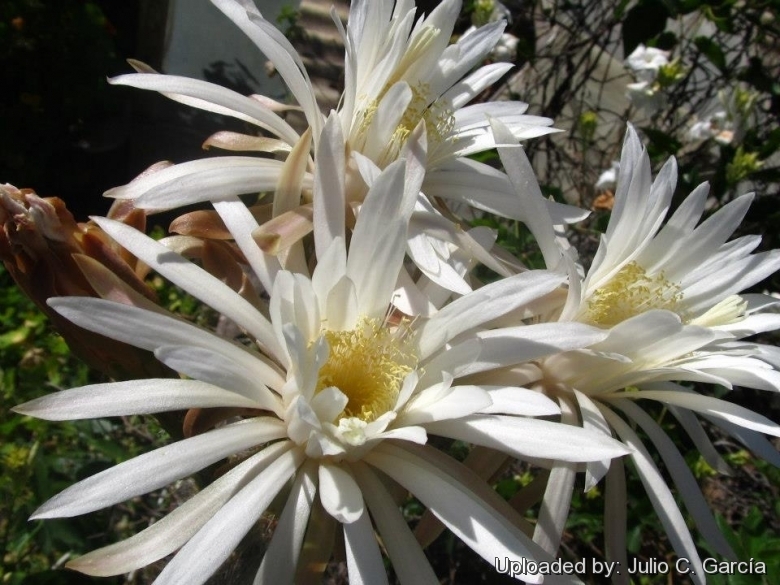 Garden uses: In Mexico it is one of the most widely cultivated species for the beauty of its white flowers that open at night. Sometime it is used as a strong and fast growing grafting stock. Food uses: It is grown in Mexico (Sonora), California and Chile for its fruit.